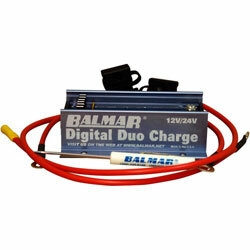 The Balmar DDC-12/24 Digital Duo Charge provides a safe, intelligent alternative for the care of your vessel's engine starting battery. Unlike switches, isolators and other charge splitting devices, the Duo Charge is mounted between the vessel's house and starting batteries rather than between the alternator and batteries. This allows the alternator and regulator to concentrate output based on the house battery's needs. When the Duo Charge senses charging voltage at the house battery, it works like a DC to- DC battery charger, providing up to 30 amps of regulated charging current to support the starting battery. In most installations, the Duo Charge requires just four wires for operation; a fused input wire, a fused output wire, a ground wire and an ON/OFF wire. In applications where the Duo Charge is used to supply a battery bank that may require more than 30 amps of regulated charging current, the Duo Charge may be used to manually control an external solenoid.